ΠΑΚΕΤΑ ΗΛΕΚΤΡΟΝΙΚΩΝ ΤΣΙΓΑΡΩΝ :: MODS ΜΠΑΤΑΡΙΟΘΗΚΕΣ ΗΛΕΚΤΡΟΝΙΚΕΣ & ΜΗΧΑΝΙΚΕΣ :: JOYETECH eCOM SUPREME VV/VW BATTERY KIT 30W - Funstore.gr the fun side of shopping! 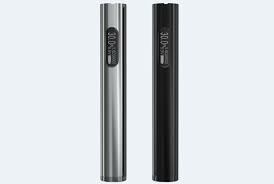 30W Joyetech eCOM Supreme is a 2200mAh high-magnification 18650 battery with the standard 510 thread. It features VV/VW and an OLED display, showing the atomizer resistance, output voltage and wattage, dump energy, as well as puffs taken. Power on and off: press the button for 5 times in quick succession, the battery will be on for using and OLED screen is enabled. In the same way, eCom Supreme will be powered off after 5 presses. VV mode (3V-8V): in this mode, voltage can be adjusted by rotating the bottom regulation ring clockwise or counterclockwise. The real-time voltage (V) will be displayd on the OLED screen. VW mode (2W-30W): in this mode, wattage can be adjusted by rotating the bottom regulation ring clockwise or counterclockwise. The real-time voltage (W) will be displayd on the OLED screen. Mode selection: when the battery is in power-on state, press the button for 3 times to switch to VV/VW mode. Charging: plug the USB cable to the eCom Supreme, and connect it to the wall adapter or other power source such as a computer. (it can be used while on charge.) It takes about 3 hours to fully charge the eCom Supreme through the 1A usb cable and about 5 hours through 0.5A USB cable. 10s cutoff: when you keep pressing the button for over 10 seconds, the output will shut off and the OLED screen will show "Over 10s Protection". Atomizer Resistance Detection: when the atomizer resistance is lower than 0.5ohm, the OLED screen will display "Atomizer Low". Low-voltage protection: when the voltage is below 3.3v, the battery will be locked and refuse to be restarted. Short-circuit protection: when the battery short-circuit occurs or output beyond the load capacity, the OLED screen will display "Protection". It's only a battery kit, so doesn't come with cartomizer/tank.